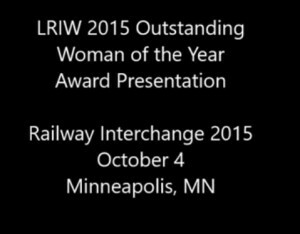 Minneapolis, MN, October 6, 2015 – The League of Railway Industry Women (LRIW) has named GO Transit's Vice President of Customer Service Mary Proc as the winner of the 2015 Outstanding Woman of the Year award. 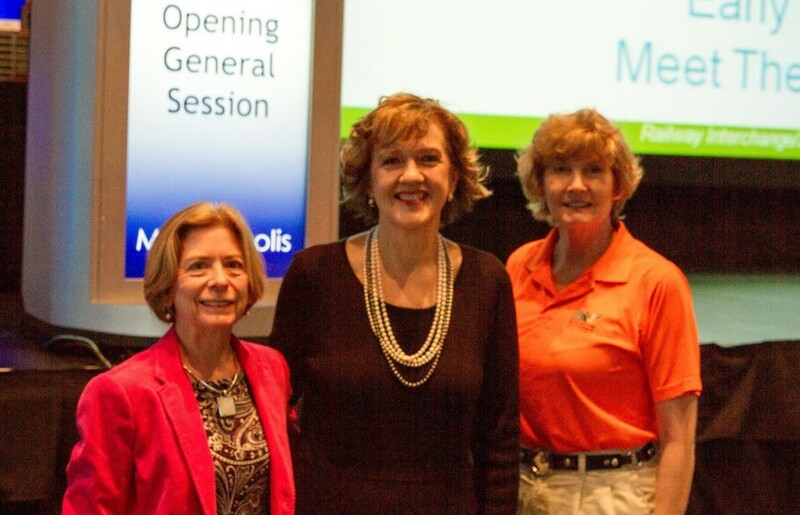 Proc was honored at the General Opening Session at Railway Interchange 2015 in Minneapolis, Minnesota on October 5, 2015. Over 9,500 attendees from this combined railway industry conference were on hand for the joint exhibits and technical conferences. The annual award is designed to recognize a woman who “consistently demonstrates vision, initiative, creativity and guidance in a leadership role”. Additional nomination criteria include “innovative, problem solving, bringing consistent excellence to her organization and the surrounding community”. Co-sponsored by Progressive Railroading, this award offers an annual review of the growing accomplishments of women in the rail industry. An international organization with the goal to provide mentorship and support for the growth of all women in railroading, LRIW is particularly pleased to recognize Mary Proc. Proc oversees station operations, transit safety and customer care for GO Transit. The development of the customer service strategy for GO, as well as giving support to a broader array of Metrolinx groups such as PRESTO and UP Express (Union Pearson Express) are her major focus. With a staff of 700 spread across a broad geography, Proc's leadership requirements are vigorous. Her vision for Customer Service standards has raised the bar for the entire Canadian Industry. The Canadian Urban Transit Association (CUTA) invited Proc to develop (and chair) their inaugural Customer Service Committee – thus sharing her expertise with all the Passenger Charters of Canada. Prior experiences at CIBC (Canadian Imperial Bank of Commerce), Canadian Airlines and the Ontario Ministry of Transportation offer both a public and private industry background. Proc lives just northwest of Toronto and takes GO Transit to work every day. “When I joined GO Transit several years ago, it was emerging from about 15 years of underfunding, and on-time performance was a real problem. In fact, so many delays had taken place on one of our lines that a passenger circulated an on-line petition, and she collected 11,000 signatures urging GO to do better. Past LRIW Outstanding Woman of the Year winners include Alaska Railroad Corp.'s Wendy Lindskoog and Norfolk Southern Corp.'s Deb Butler. A call for nominations for the 2016 LRIW Outstanding Woman of the Year award will open in the spring of 2016. For more information please contact awards@railwaywomen.org. 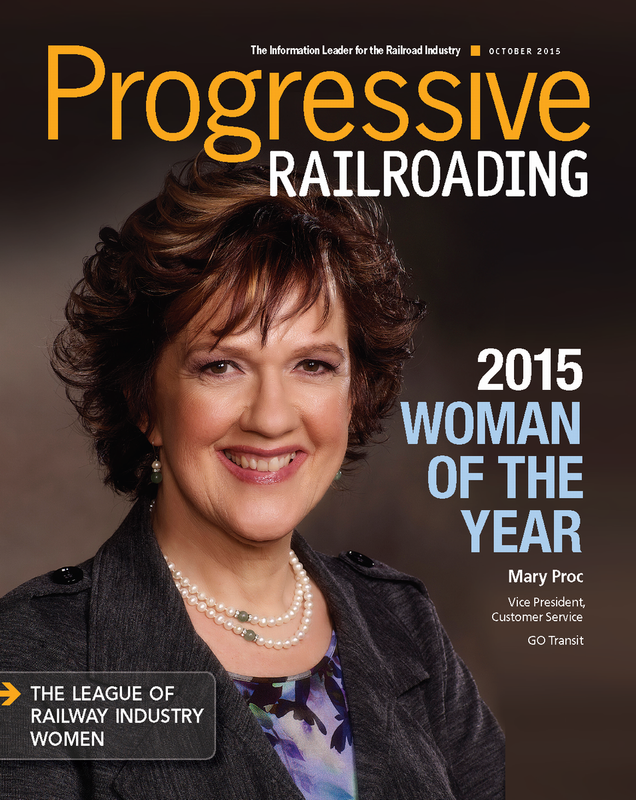 You can read more about her in the November 17, 2015 issue of Progressive Railroading.